Despite my crash out of the Southern Upland Way earlier this year, I find that I still have a pressing need to walk. This comes as an immense relief in more ways than one. I’m pleased I still feel the desire to get out and string a few days together, as I wasn’t sure that would return after the SUW. But also, in a year when I haven’t been injured and yet I’ve still done very few solo day walks, I was beginning to worry if I’d lost the desire to walk completely. The traditional Dales Way walk begins in Ilkely, runs for 76 miles and finishes in the Lake District at Windermere. More than 20 miles of that walk are outside the Dales National Park boundary and most of the walk is low level, through the valleys, with only about 10 miles being above the 1200 foot contour line. 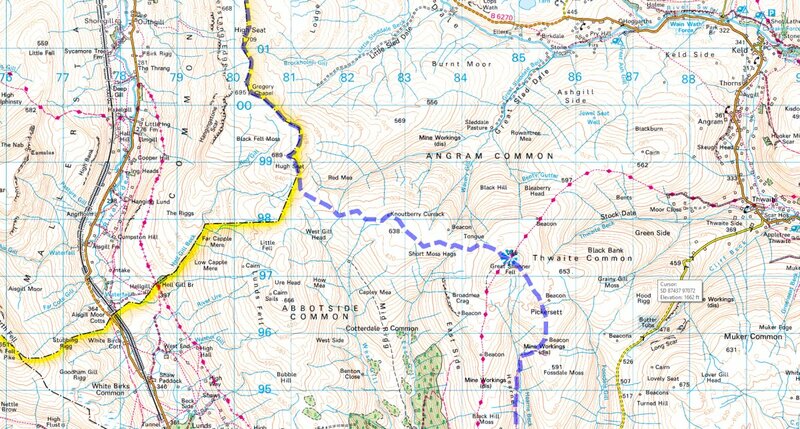 There’s a high level alternative, called the Dales High Way which runs for 90 miles, 40 miles of which are outside the Park and this spends considerably more time above the 1200 foot contour, but covers very popular tracks for the most part, very little of which is new to me. I decided I wanted an alternative to them both. So I got a huge cup of tea, a packet of McVities Digestives, opened Memory Map on my PC and started work. My first criteria was to start and end at a train station. My second was that, wherever possible, it should incorporate paths I’ve not used before. Thirdly it should allow me to finish in a town each evening so I can use B&Bs. In the end, my tea ran out before the biscuits did and they ran out before my route was finished, but I eventually had something I was happy with. The route is around 55 miles long, it starts at one end of the Dales at Skipton and finishes at the far side of the Park’s boundary at Kirkby Stephen. It spends the majority of its time above 1200 feet (28 miles of the 55 in fact) and will allow me to add a good number of new OS squares to my tally. Day one takes me from Skipton station to Grassington, across Embsay Moor and Barden Moor, using a direct route through the middle, rather than the more traditional edge route. Day two runs from Grassington, using the Dales Way to Kettlewell then taking a higher path on eastern side of Wharfedale via Starbotton and the wonderfully names Knuckle Bone Pasture down in to Buckden. Day three leaves Buckden and again uses the traditional Dales Way path as far as Oughtershaw, where I divert to cross Dodd Fell and use the Pennine Way to drop into Hawes and beyond, to Hardraw and the Green Dragon. 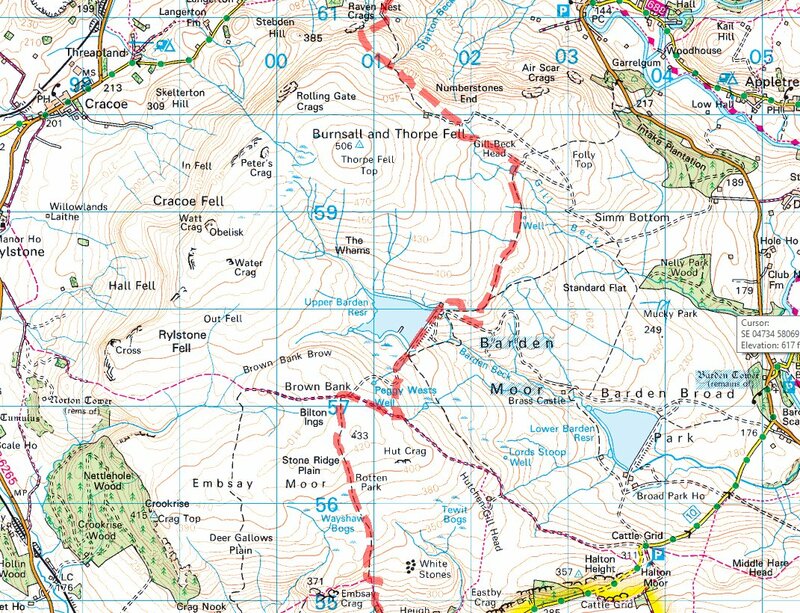 Day four takes me from Hardraw up to Great Shunner Fell, but using the Hearne Coal Road rather than the Pennine Way and then across Angram Common to Mallerstang Edge and down the B6270 into Nateby and Kirkby Stephen station. I’m planning on walking this during the week of the Bank Holiday. Let’s hope the weather plays its part! Early September is right at the cusp isn’t it – could be great, could be awful, expecting a bit of both if I’m honest. Will be good to be back out tho, so don’t really mind too much. Good to see you back on the trail. I was up in Mallerstang a few weeks ago, wonderfully quiet and wild. Yep, nice ridge, with great views across to Wild Boar Fell. Always wanted to walk across to/from Great Shunner Fell, but not easy to do as a circular day walk. Looks like a good route there mate 🙂 Hope the wind stays off! I hope that the weather is kind to you and I’ll be interested in reading your blog reports as its something I might like to try myself. Thanks Brian, my main worry is whether my legs are up to it or not, not having walked more than 4-5 miles at a time in the last 6 weeks or so!